POINT PLEASANT, W.Va. — An emphatic finish to a strong first week of the season. 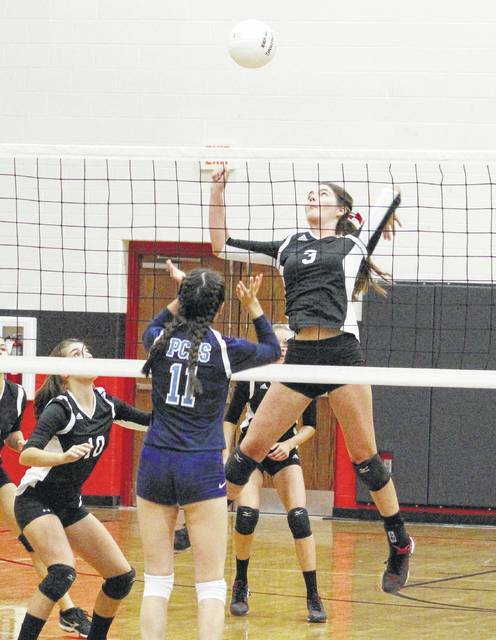 The Point Pleasant volleyball team remained unbeaten while claiming the program’s first victory over visiting Parkersburg Catholic on Thursday night during a 25-15, 25-21, 25-16 decision in a non-conference match in Mason County. The Lady Knights (2-0) won the first game wire-to-wire and never trailed by more than four points in either of the remaining games, allowing the hosts to claim their second consecutive straight-game triumph. The Red and Black jumped out to early leads of 3-0 and 9-2 in the opener, then eventually rolled to a 10-point win — their largest lead of the entire match. The Lady Crusaders (0-5) responded in Game 2 as both squads battled through five ties and six lead changes, with the guests establishing two-point leads on four different occasions — the last of which came 14-12. PPHS, however, rallied off five straight points for a 17-14 advantage … and never trailed again. The hosts went on to lead by as many as four points on three different occassions — including the 25-21 final that led to a 2-0 match advantage. There were 10 ties and 11 lead changes in Game 3 as PCHS built its biggest lead at 6-2, then the teams found themselves deadlocked at six, seven, eight, nine, 10, 11, 13, 14, 15 and finally at 16-all. The Lady Knights went on to win the last nine points of the finale, allowing them to claim the straight-game decision. Afterwards, PPHS coach Marla Cottrill was pleased with how her kids worked collectively — which led to a much-desired result. Peyton Jordan led the Lady Knights with 23 service points, which included six aces — two of which came while she served out the final nine points of Game 3. Madison Hatfield was next with seven points, while Mackenzie Freeman chipped in six points. Gracie Cottrill and Brenna Dotson also recorded three points apiece for the victors. Hatfield had two aces, while Cottrill and Freeman also had an ace each. Brenna Dotson led the Point net attack with eight kills and two blocks, followed by Lanea Cochran and Olivia Dotson with six kills apiece. Cottrill also contributed four kills and a team-best 15 digs. Gracie Lowers led the guests with five service points, followed by Madison Ross and Emily Stewart with four points apiece. Olivia Ullman was next with three points, while Jenna Boice and Maria Tallman each scored two points. Point Pleasant played in a tri-match at Ravenswood on Saturday and returns to action Monday when it travels to Cross Lanes Christian for a 6 p.m. contest. Point Pleasant sophomore Olivia Dotson hits a spike attempt during Game 3 of Thursday night’s volleyball contest against Parkersburg Catholic in Point Pleasant, W.Va.
Point Pleasant senior Brenna Dotson (3) prepares for a spike attempt during Game 1 of Thursday night’s volleyball contest against Parkersburg Catholic in Point Pleasant, W.Va.